The Advent Monza N2 is a budget laptop with a super-low price tag and healthy pound-for-pound tech specs. Unfortunately, it doesn't manage to match its rivals for power or performance. At first glance, the Advent Monza looks like a strong contender. Advent has a good track record of getting its laptops into low price points yet fill them with competitive extras. The Monza is no different, and features a colossal 8GB of RAM, which you won't find anywhere else at this price, and a very healthy 500GB hard drive, where many rivals will scrimp to 250GB or 320GB of storage space. Unfortunately though, at the heart of this budget PC is an aging dual core AMD Athlon II processor, and unsurprisingly, the chip doesn't produce the grunt of its nearest Intel based rivals. We tested the best laptops under £350, and all but one comfortably thrashed the Monza in our benchmarking tests. The score of 4,402 in our processor lab tests puts it well behind even the closest matched budget laptops, and a lowly 3D Mark score of 1,701 backs this up. In real terms this means that the basic email, web and office tasks in Microsoft Word will be well within reach, but anything that needs power, such as games, movies, picture editing and even multitasking programs will push the Monza to its limits. AMD has always maintained that reviewers should look beyond benchmark scores when measuring performance, and luckily, at What Laptop Tablet & Smartphone, that's exactly what we do. The bad news for AMD is that our own testing backed up the Advent's poor performance. HD videos were choppy at full 1080p, and even 720p videos suffered from substantial 'screen tearing,' which is where lines appear in the footage as the processor struggles to keep up. AMD based machines tend to be strong at video playback, but such is the age of this processor, we still experienced problems. We also found loading times to be frustratingly slow when starting programs like Microsoft Word for the first time, but the 8GB of RAM helped keep everything responsive after the initial lag. Battery life, however, was truly woeful. Our stress test involves looping HD video and mimicking light office tasks, and the battery gave out in a paltry 72 minutes, which isn't even long enough to watch a full movie while traveling. Build quality was solid, and we found little flex around the body. The lid and base have a reassuring feel to them, and the textured blue plastic finish is pleasing on the eye, if less so to the touch. That said, the keys are extremely basic and hard to type on for long periods. The track pad is easy to use, but slow to the touch, and there are no multi-touch features or gestures for scrolling web pages, which we sorely missed. The Advent Monza is, pound-for-pound, a fantastic bargain on paper, but in our labs and during real world tests, we found it lacking. 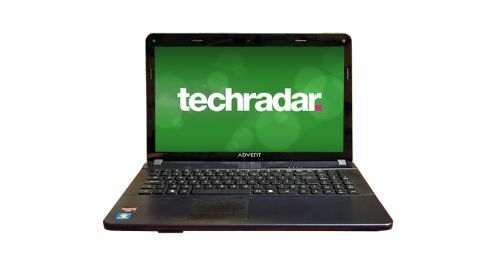 If you want to do nothing but the absolute basics the Advent Monza will suffice, but we'd still recommend looking at the Acer Aspire 5750 or HP Pavilion g6.